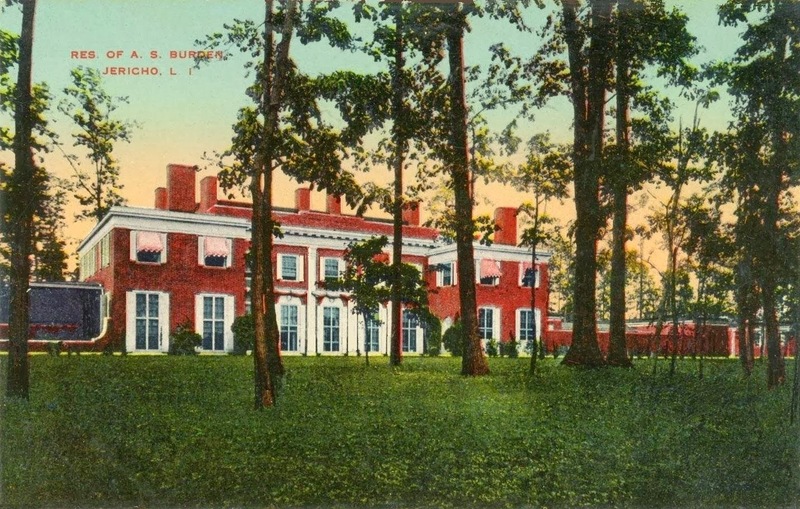 'Oak Hill', the Arthur Scott Burden estate designed by John Russell Pope c. 1915 in Brookville. Click HERE for more on 'Oak Hill' and HERE to see a brochure from when the estate was for sale. Zach, have you attempted to get pics of the walled garden ruins? Archibuff, so sad to see the photos. I wonder what happened to the storybook figures that graced the outside of the house. Newsday has confirmed that a demolition permit was approved on Thursday to demolish the entire 87 room mansion. So so sad on so many levels. Disgusting - the razing of Inisfada. While I'd like to think that as much of the salvageable contents were extracted - lintels, marble, paneling, slate, leaded glass - it would appear from the pictures that wasn't the case. Do they not understand just how much those materials are worth? I suppose like the Baltimore Colts fleeing under the cover of darkness the owners and demo crew just wanted to be done asap. It's amazing how quick this country will demolish all of its rich past and replace it with the most unworthy of structures. ^ I had read in an old article that the developer was from Hong Kong...so in this case it wasn't this country that demolished its past. To amend my comment as the Newsday article actually refutes what I said: "Loaded trucks this week have carted windows, mantels, doors and other items off the property,"
So at least they did take away some of the 'gilded' pieces before the wrecking ball. What can never be salvaged is the sense of place for the village and a unique historic treasure trove of architectural spaces and voluminous interiors that will not be duplicated anywhere, but only in someones too small living room with a salvaged mantle here and a piece of wood paneling there. The wonder of driving up to the entrance facade and seeing the shear immensity and majesty of such a building, is lost forever and we will all be poorer by this thoughtless act of vandalism. I don't want to think of the dozens of individually designed, magnificently twisted brick chimneys, all unique and all slated to crash to the ground. Such senseless destruction. Words cannot convey the sickening loss of this beautiful house although, truth be told, this event will be unsurprising end to anyone who has driven through North Hills lately. One can draw a straight line from Peter Grace's efforts 30+ years ago to build a shopping mall on what was then the primeval forest bwt the LIE and Northern Pkwy and the subsequent wholesale rezoning of the Village of North Hills to permit high density housing and the events occurring at Inisfada today. Per Newsday late on Friday afternoon the demo work is half-done. The remarks by the Mayor couldn't have been any more pro-development if he tried. Babble about the mansion 'unlivable with asbestos, this is progress, think of the added tax revenue', etc etc gibberish. One has trouble wrapping one's head around it. It's so wrong, seems so logical that it shouldn't happen, yet it happened.